2 x 512 MPTS or SPTS IPTV input streams. 2 x input streams Demuxers. 2 x 512 SPTS IP output streams. ip streams 2 x 512 MPTS or SPTS IPTV input streams. network 2 x GigaE 1000Base-T Ethernet Interface. DEmux 2 x input DEMUX. PID filtering and re-mapping. PSI/SI editing and insertion. 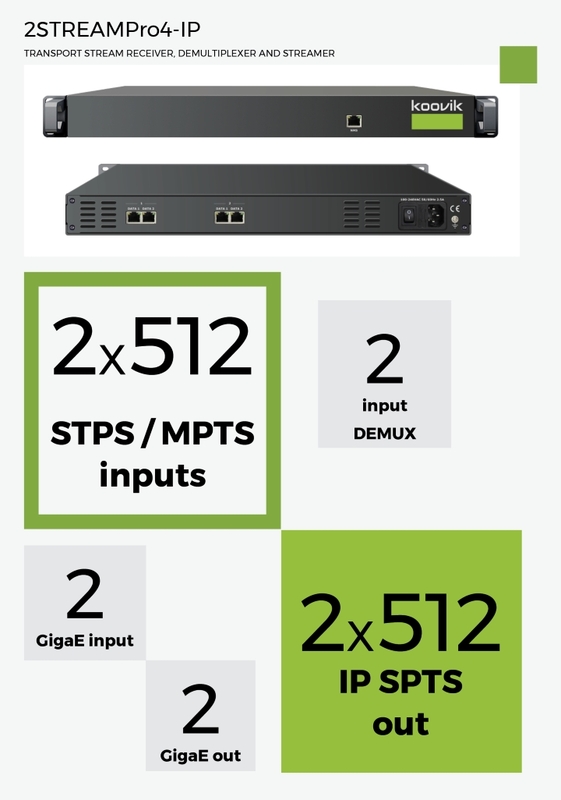 IP SPTS 2 x 512 SPTS output over UDP or RTP/RTSP. Unicast or Multicast. included 1 x mains cable, 1 x ground cable.